Thomas enjoys sitting on the stool at the kitchen bench watching his daddy cook, here he is watching him make home-made pizza! This is such an important activity for Thomas to be doing, soon he'll be able to help cook. 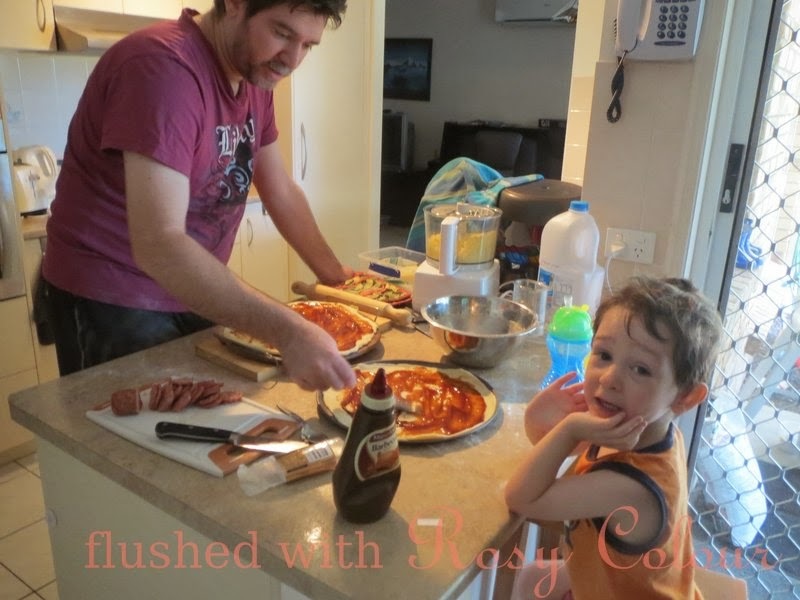 David already gets him to help a little where he can, like patting the dough when it was getting kneaded or placing the pepperoni on the pizza. David used to make special pizza dough in the bread machine and it would take an hour just to rise, until he found this recipe which is quick because it doesn't use yeast, and doesn't use the machine. Its very yummy so we've decided to make pizza like this from now on. I also like to use free range salami, I'm so happy to have found that at Coles online, I try and get free range meat whenever I can, and always get free range eggs!